Malcolm Dawson writes……..two weeks ago we celebrated the first win of the Donald/Methvyn/Jack Ross era in a way that was hard to beat with a winner deep into time added on, having fallen behind in the first half. Today beat that. I’d like to say this was the perfect performance. It wasn’t and the manager admitted that there is room for improvement but hey this afternoon was the most enjoyable I’ve experienced at the Stadium of Light for I don’t know how long. It was better than the Charlton game because for this one the passing was crisp, the movement brisk, the energy levels stratospheric and we went ahead, then further ahead and after the third went in even I could relax just a little and savour the performance, with just the ever lingering apprehension that this is Sunderland and that anything can happen. But this is a different Sunderland. Here is a group of players who seem to be revelling in playing for the club. They were organised, confident on the ball and worked for each other. Gosh they even moved about and made themselves available when we had a throw in and it’s an age since I’ve seen that! The crowd was fantastic again and even sang Lee Cattermole’s name at one point perhaps showing those who were giving him some stick in recent weeks that he can still be an asset if an expensive one. The same goes for Oviedo who could have gone off following a painful challenge, but stayed on to finish the game. At the end Maguire, who had been subbed came back on the pitch to thank the crowd and was last off together with Loovens who looks as if he really can’t believe his luck at being signed. Add to that the mentions the crowd got from Methven and McLaughlin in the programme for the roar of encouragement that went up following the Charlton goal alongside the piece from our own Pete Sixsmith. Speaking of Pete I suppose I better stop eulogising and let him recount today’s proceedings in his own eloquent way. That’s what you are here for after all! Neither of us knew, although we both remembered that day in February 2017 when goals from Kone, Ndong and Defoe (2) put us four up at Crystal Palace in what was Bryan Oviedo’s debut. We also remembered that glorious day in February 1964 when we were three up at home to League Champions Everton in an FA Cup 5th Round game in front of 62,817 thanks to goals from Jimmy McNab in the third minute, Charlie Hurley in the 27th and an own goal from Mick Meagan in the 32nd. We went on to win 3-1 and take on Manchester United three times in the quarter final. Some research back at Sixsmith Towers turned up a game against Stoke City in September 2011 when Titus Bramble., a Jonathon Woodgate own goal and a Craig Gardener free kick sent us into the dressing rooms 3 up. Seb Larsson wrapped it up in the 58th. Since then, nothing – or at least until today, when Scunthorpe United were despatched in as comfortable a way as I have seen for a long time. Yes, it’s the Third Division, yes, they have lost some good players over the summer, no I am not going to get carried away – and yes, I thoroughly enjoyed it. So too did 28,000 Sunderland supporters as they watched a team that has been thrown together since July play in a swashbuckling way that has rarely been seen at The Stadium since the great days of Quinn and Phillips, Johnston and Summerbee and Makin and Gray. Players looked comfortable on the ball. There was solid defending. The midfield moved quickly. There were spells of intense short passing and then, BOOM, a raking long ball from one side of the field to the other was played. The goalkeeper was sound. Both first choice full backs drew on their considerable experience and went forward well. Oviedo was excellent both as an attacker and a defender. His cross for Max Power’s goal was as good as the one he put in for Gooch two weeks ago and he linked brilliantly with Gooch and Maguire. Baldwin and Loovens looked as safe as the Bank of England at the back. Lee Novak, the Scunthorpe forward, had a very low rate of interest in this game, as Baldwin had him in his pocket for the entire ninety minutes and Loovens was calmness personified apart form a couple of minor blips. But it was in midfield that the most pleasure was to be derived. 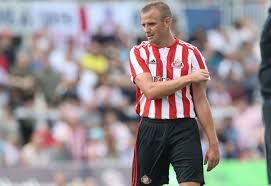 Lee Cattermole’s recall was not greeted with universal approbation. Some thought it a risk. He had done well enough in the practice match that masqueraded as a League Cup tie on Thursday, but how would he cope with a league in which he had had no experience? Was he too slow? Would he be caught out? Was he a liability? “Nay, nay, a thousand times nay” as Frankie Howard used to say. Used in a role that suited him perfectly just in front of the back four and with willing youngsters there to do his running, he had a stormer and even got into the Scunthorpe box. Aided and abetted by the impressive Max Power (crazy name, crazy guy), the industrious George Honeyman and the mercurial Lynden Gooch, The Iron were hammered into a shape akin to that of a flattened Tom Cat when Jerry Mouse cuts the rope thus allowing the anvil to fall on the foolish feline. 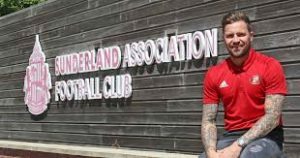 Chris Maguire popped up everywhere and Josh Maja produced some shimmies and moves that would guarantee him a place on Strictly were he ever to become really famous. The goals were splendid. A powerful header from who else but Max of that ilk, reminded this watcher of Charlie Hurley in his pomp. The delivery by Oviedo was as out of place at a third level game as Richard Burton would have been at the Brandon and Byshottles Amateur Dramatic and Light Opera Group. It begged to be thumped in and it was. Oviedo also played a part in the second, working the ball to Maja who whipped it into the net to keep up his average of a goal a game. He should have made it a goal every 0.75 of a game in the second half had he planted a ridiculously easy chance between the posts, But good players often miss easy chances – Kevin Phillips missed a few and Pop Robson once put one over the bar at White Hart Lane from two yards. The third was a sublime back heel by Chris Maguire after a wonderful one two from Honeyman and Gooch. Our American winger had destroyed the Scunthorpe full back, Lewis Butroid, a young player starting his second full season as an Iron first teamer. He will lock himself in a cupboard for the next few weeks whenever the name Gooch is mentioned because I have rarely seen a defender systematically destroyed as this young man was. Hopefully, his career will recover – or at least until January when we play them again. 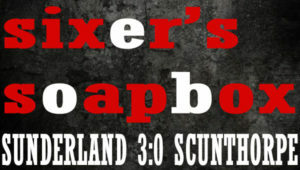 Scunny were outclassed and outplayed. The penalty claims they made in the first half were genuine but a look at it shows that Baldwin got to the ball before George Thomas and headed it away before the forward tumbled over. The referee, who was at best ok, called that one right. But throughout the game the 10 outfield players pressed the men in yellow all over the pitch and never allowed the opposition to settle. Furthermore all 11 players made themselves available to receive a pass so there were always options for the ball carrier. Most times good decisions were made. Occasionally the desire to create openings and play the ball out from the back led to errors but Jack Ross is developing a culture where players are encouraged to play without fear. One swallow does not make a summer but the signs here were very encouraging. When Matthews limped off and James came on, we switched to a back three and pushed Oviedo up. Would any of the previous three managers have done that? Answers on a postcard please. There are two difficult tests looming next week. A minimum of two points is required and four or above would be more than satisfactory. Flanagan and McGeouch may be ready for one or both, leaving Jack Ross with some tricky decisions to make. Good. That’s how it should be………. Enjoyed it as much as you did but only one point of concern – Loovens. I agree he must think himself lucky to be signed, as it seems obvious to me that his legs have gone – he might be a good influence, but at times on the ball he played at walking pace, not to lower the tempo but just that was where he was comfortable. Hope he can cope for a whole season though as the alternative is even more worrying! Sounds like it’s glass half empty for me but not true, the best opening to a season for a number of years despite the league we’re in. I agree that Loovens was slow, and made one mistake in particular – mis-hitting a weak back pass – which he got away with in a way that Ozturk didn’t. But the overall composure at the back was an improvement on the League Cup game. Baldwin (a real find, I really like the look of him) gets better every game, and the two of them look a good pairing. Power and Reese James also look great signings, and Maguire is a skilful targetman who holds the ball up well. Ross has done some good business, and when Wyke gets fit we might have some decent firepower up front to assist Maja. Cattermole, who was finished at the highest level years ago, looks like he can extend his mileage in this league, which is much more forgiving of his errors and lack of pace. And Gooch, who wasn’t really good enough to cut it in the Premier, suddenly looks a world-beater. I’m not getting carried away but, as Pete says, the work-rate, pressing and challenging, and running off the ball just stands out in stark contrast to the years and years of the sad, pathetic fayre we’ve been served for years. We absolutely must get out of this league at the first attempt, and yesterday at least gave me hope that it can happen. I travelled up from my Norwich exile out of duty to my son who has been nagging me for ages to bring him up to a game. I couldn’t believe the surprise in my own voice when I said “cattermoles playing really well” “ I can’t belive the passing” etc. I’ve not enjoyed watching The lads like this for a long time. Keep this up and I promise I won’t complain about the 5 hour drive again! Thoroughly enjoyed the match and coming home. Keep it up lads. The signs are good though. I revise my opinion on the Scunny pen. Baldwin clearly heads the ball away. Well done ref. Great read. I’d also like to compliment Jack Ross for his game management. Rested key players and went to a back 3 to negate Scunnys kick and rush, BEFORE it happened. Also doubling up Honeyman and Gooch, and playing a false left winger giving Oviedo freedom, also worthy of praise. I like Jack Ross football style, on and off the pitch. Can only add that after re watching our sublime third goal (from which you omitted an original tremendous long ball from Power),one does get the feeling that something special is growing in the bowels of SAFC. Small things like this send out big messages.